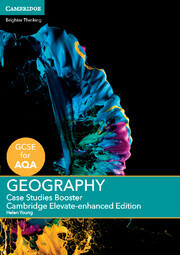 Written for the AQA GCSE Geography specification for first teaching from 2016, this print Student Book fully covers the new AQA GCSE Geography qualification. This full-colour book includes differentiated activities providing support for weaker students and stretch for more able students. Test your progress pages provide regular assessment practice and opportunities for students to check their progress, and a dedicated section on skills development helps to reinforce understanding. This Student Book also includes specially written decision-making exercises, guidance on carrying out fieldwork plus activities to help develop fieldwork skills, and a range of up-to-date UK and international case studies. 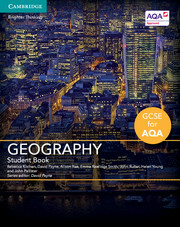 Covers the new AQA GCSE specification and assessment objectives, and has been written specifically for the new linear qualification. Issue evaluation spreads are included in every core section to develop analytical and decision-making skills. Includes ‘Test your progress’ pages, which provide regular assessment practice and self-assessment opportunities throughout for students to check their progress. Section openers provide a background and overview of key themes and learning outcomes are included at the beginning of each chapter. 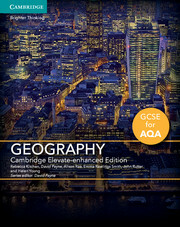 Includes a range of up-to-date UK and international case studies to show concepts in context. 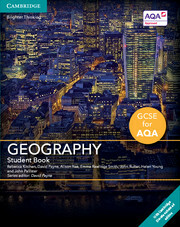 Includes ‘key terms’ which are highlighted for ease of learning and gathered in a glossary at the back of the book; ‘web links’ to further information online; ‘did you know boxes’ with interesting facts to relate topics to the real world and engage students; and ‘further research’ boxes with suggestions for wider reading. An enhanced digital version and free Teacher's Resource are also available.